Wine glasses have confounded us for a while now. Why did champagne glasses change from little saucers to long flutes? Why do some look like fishbowls and others not? 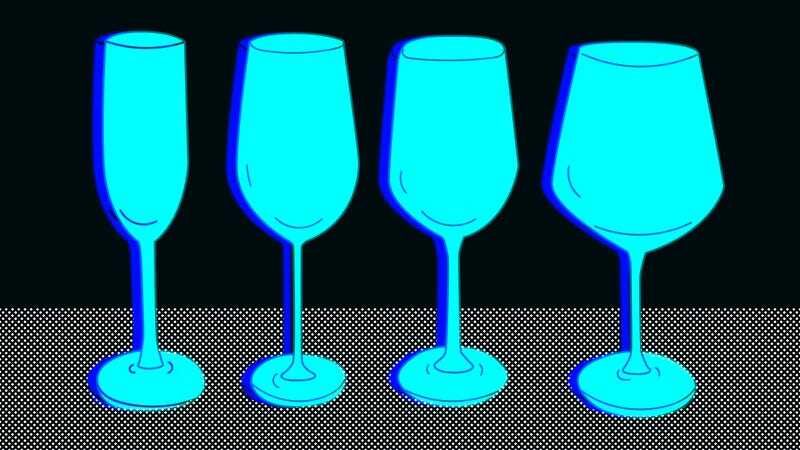 Why are we pretty sure we’re putting the wrong type of wine in just about every glass? When you’re as clueless as we are, you’d best turn to an expert. Lucky for us, Alpana Singh was happy to help. The former host of Check, Please!—an immensely popular restaurant review show on Chicago TV—and the youngest female ever to pass the final level of the master sommelier exam now runs two restaurants in the Chicago area: Terra And Vine and The Boarding House. The latter is only a few blocks away from our offices, so on a recent afternoon Singh generously sat down to educate a dummkopf like myself on the considerable science behind the shape of wine glasses. Whatever your price range, what wine glasses do you need to have in your arsenal? Singh likes to break wineglasses down into the classic four. Singh starts out by holding up the flute she uses in her restaurant. She tells me there’s an etch at the bottom of the glass, and it’s this scratch that causes bubbles to form in your champagne. But what about those old-school, Gatsby-esque champagne coupes? They’re virtually the opposite of a flute. Singh tells me that the shape was modeled after the curvature of Marie Antoinette’s breast. The problem with this shape, she says, is it’s too wide of an area and the bubbles disappear. So my takeaway: Flutes are lovely if you enjoy the bubbles, but perhaps I should consider cheap, small wine glass for my champagne-drinking experience. I’m admiring this all-purpose glass that Singh uses throughout her restaurant when she tells me it comes from a surprising-yet-not source: Costco. “This is the glass that actually I have at home. They were $2.50 a glass, and what I like about it is that you can throw it in the dishwasher. It’s got the stem and the bowl and it allows you to swirl.” It’s her go-to glass for everything. I toss out one of the few wine facts that I thought I knew: that if the wine is red, it’s okay to touch the bowl, but if it’s white, that’s bad, because you’ll warm up the wine too quickly? Turns out I don’t even really have that one right, as Singh replies, “It depends. Most people drink fairly quickly, so it doesn’t necessarily matter. But this glass also allows the stem for swirling. I like to make the analogy that there’s nothing wrong with flats, but there’s something very exquisite about stilettos.” Which I think makes the stemless glasses I favor at home the wine version of Birkenstocks. So now that I understand what a bowl is, I need to learn about shoulders, which is not a term I have ever heard before related to glasses. Singh holds up one of those giant fishbowl glasses I’ve always wondered about: a burgundy glass. This is why these two glasses are made for different grape varietals: Thin-skinned grapes, which are all about the aroma (Vernashen, Gamay, Beaujolais, Dolcetto, Barbera), get the burgundy glass. Thicker-skinned grapes (cabernet, Malbec, petit verdot) that need opening up get the Bordeaux glass for swirling. Sadly, as I mentioned my wine glass collection right now mostly consists of stemless, which we bought a case of at either Costco or Ikea after we lost most of our stemmed wine glasses once we had kids and practically everything breakable in the house was destroyed. According to Singh, I’m not alone: “I actually had dinner with Maximillian Riedel one night. He’s the heir to Riedel; he runs the company now. And he said he invented the stemless glassware. He said, ‘I live in New York. I don’t have cabinet space and they stack and it was just something that was more youthful and more fun.’” And fortunately or unfortunately, people usually drink wine so quickly, there’s not much danger that the white will be ruined by getting warmed up from someone holding it in a glass without a stem. Now that I know enough about the reasons that wine glasses are the way they are to amaze my friends at parties, I also know that the market runs the gamut from Target (Singh’s favorite retailer for glasses) to specific glasses for specific varietals “that direct the wine to the part of your palate where a Syrah should be,” Singh says. Ultimately, she doesn’t think it’s necessary for the majority of us who aren’t master sommeliers. “I just think you go buy the best most affordable wine glass you can find,” Singh says.